Chicken Fat: Elvis Presley Died For Your Sins! Wait! Actually He died for His sins. 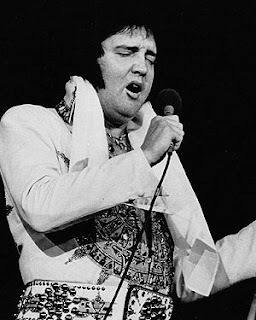 On this date 30 years ago Elvis died. Four or five years ago we paid homage to him and toured Graceland. About the only thing I know to say about him is that he sure could sing. Yes, and he was pretty to look at,in the early days, but not in this photo. When family mentions that it's the anniversay of someone's death, my brother snaps, "We don't celebrate negative anniversaries." Did we recently celebrate Elvis's birthday? There's an Elvis impersonator near here who has his own concert hall. It's a treat to meet this aging Elvis who isn't fat and his blonde wife. Their names are Kenn and Barbie. There names seems like it was created for their roles. I like to see a good Elvis imatator - they seem to pop up in bizarre places. Oh, by the way, I meant to tell you - you have great taste in movies (Oh Brother, Where Art Thou?). He seemed like he was very generous.